"It was like Christmas Day all over again for her," says Scot. "I was hooking her up to the dialysis machine when the call came in. She started unhooking herself, got dressed and off she went." "She was all ready and they said that as soon as they found a bed for her, they would begin prepping her for surgery. They kept coming in every half an hour reassuring her that everything would be fine," said Scot. "They came in and said they couldn't find a bed for her and she would have to go home." Gina's transplant was cancelled and as far as they understood, the organ went to waste. Oxford University Hospitals NHS Foundation Trust said it could not comment on individual cases but told 5 Live Investigates that "decisions taken about any individual patient's care are taken in the best interests of that patient by the clinicians who are looking after them". "I can't help but think the family who donated the kidney would be devastated just as much as I was, if not more so." Although rare, Gina's case is not unique. Prof Nizam Mamode is chairman of the chapter of surgeons, at the British Transplantation Society. He told the programme that the transplant service is "more than creaking". "I think it really is at breaking point. I don't think people can continue for much longer working on this basis and I think it really needs some urgent action. "There's been a huge success in transplantation. The number of transplants has increased by about 50% over the last eight to 10 years, but the workload has gone up for everybody." 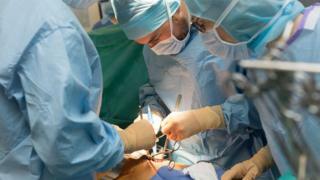 Prof Mamode said that the transplants team was under "very, very significant" stress, with surgeons regularly working extremely long shifts without a break. It found organ retrieval staff are experiencing "extreme stress". And it added that while it will take several years before the full impact of the changes will be felt, "transplant capacity is already struggling to meet demand in some units". They added that they were working with NHSBT and hospitals across the UK "to ensure opportunities for organ donation and transplantation are maximised within existing resources". Meanwhile, the Scottish government said the capacity issues facing parts of the NHS in England are "not replicated in Scottish transplant units" but continues to monitor the situation closely, adding it is "very rare in Scotland for a transplant unit to decline an organ due to capacity issues". "We are aware of some cases across the country where, because of lack of capacity, an organ ends up not being transplanted because once you get to a very long time, the organ now is no longer suitable to be transplanted - that's a rare event but that has happened." Scot says the fact that his wife Gina's operation did not go ahead left her "devastated". "She kept it together long enough to get home and the sat down and started bawling. She thought it was going to be another four years if ever that she'd get another kidney or another chance at a kidney." "We fully understand this approach will present a challenge to resources, including staffing. That's why we're investing an extra £34bn a year in cash terms into the NHS by 2023/24 and there will be a 12-month transition period to allow all necessary preparations to take place." Sally Johnson, outgoing chief executive and former director of organ donation and transplantation for NHSBT, said: "Organ donation and transplantation is a highly sensitive, challenging and intense working environment where time is critical. "Every minute counts to ensure no donation goes to waste, which means we consistently work under pressure." She added they expect the number of deceased organ donors and transplants to rise when the change in law comes into force, but said NHSBT is "co-operating with all the organisations involved to make sure the necessary resources are in place to make the most of every donated organ".